The Igorot (or mountain people) inhabit the interior highlands of northern Luzon in the Philippines and may be further subclassified into at least six distinct tribal groups which share many cultural traits. An extraordinarily wide diversity of edged weapon and tool types may be found among these people to include characteristic spears both of tanged and socketed construction and a distinctive form of "head ax". Except for a brief discourse on "head axes" in Stone, the literature available to me does not distinguish which of these weapons and tools are associated with which tribal group or groups. Example 1. This hinalung type blade came mounted as a spear point on a pole. The double edged leaf shaped blade has an integral socket formed essentially from a wide tang wrapped around to form a flattened cylinder. A few bands of woven rattan cover either end of the socket/handle. The diamond shaped hollow seen at the base of the blade is continuous with the socket. 20th century. Overall length, blade and socket: 34.2 cm. (13.5 inches); blade length: 35.5 cm. (13.9 inches). Hinalung is an Ifugao (one of the six tribal groups) term for a short to moderately long double edged bladed implement which may be used on a pole as a spear or in the hand as a dagger or chopper. This possibility of dual use is facilitated by the design which incorporates a integral hollow handle or socket variably covered by rattan bands. As may be seen in the accompanying illustrations, the material of the tang has been flattened out and bent around to form a gently flattened and tapering cylinder. The work is accomplished in such a manner that the center of the socket remains in the same plane as the blade, expanding from the base of the blade in a cone like manner. Stone offers the term fangkao for a spear of this form. Example 2. 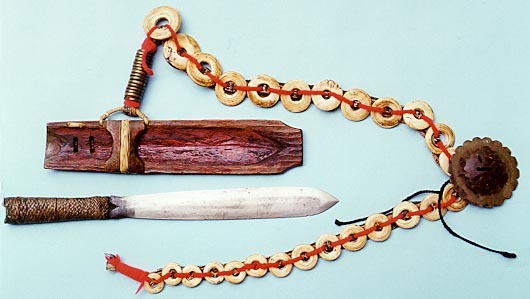 This hinalung is mounted as a dagger. The triangular hollow at the base of the blade shows parallel grooves which testify a previous existence for this piece of steel as a file. The handle is hollow and integral to the blade as with example 1 above and this implement could just as well be mounted on a pole. The scabbard, or hikot, is typical, being essentially a board hollowed slightly on one face to fit the blade which is held in place by a small low wooden arch bound to the main part of the sheath by rattan. 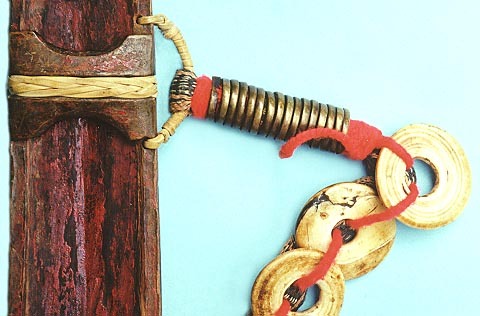 A red fabric cord and rattan belt or baldric is attached to the scabbard which is decorated by several bone discs. 20th century. Overall length, blade and handle: 39.3 cm. (16 inches); blade length: 27.9 cm. (11 inches). Example 3. Another hinalung with its open faced wooden scabbard, of essentially the same construction of the preceding two examples. The pattern upon the blade surface suggests a previous incarnation as a rasp. 20th century. Overall length, blade and handle: 32.2 cm. (12.7 inches); blade length: 20.3 cm. (8 inches). Example 4. 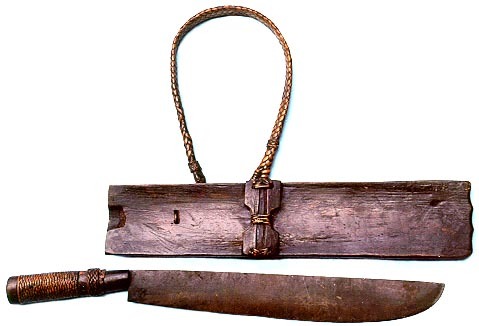 Another hinalung with its open faced wooden scabbard, of essentially the same construction of the preceding two examples but with a blade form and a blade size less adapted for use as a spear. Early to mid 20th century. Overall length, blade and handle: 45 cm. (17.8 inches); blade length: 34 cm. (13.3 inches). The open faced scabbard for these implements is termed a hikot by the Ifugao. These tend to be made of a hardwood like Philippine mahogany and consist primarily of a board 1 to 2 cm. in thickness with one face slightly inletted to the contour of the blade and the other surface flat. A low wooden arch is then strapped to the inletted face to hold the knife in place in the scabbard. A suspension loop usually arises from one side of the scabbard in the area where the two wooden components are strapped together. Example 5. A pinahig, having a single edged blade of chopper configuration widening and thinning away from the hilt. The hilt consists of a single piece of wood wrapped at each end with rattan. The tip of the tang is visible and folded over and the end of the hilt. The open faced scabbard, or hikot, is of the same construction as those above, but inletted with the contour of this blade. This was collected in the mid-1970s from one of the shops just outside of the perimeter of Clark Air Force Base. Third quarter, 20th century. Overall length, blade and handle: 54 cm. (21.3 inches); blade length: 38.6 cm. (15.2 inches). Employing an essentially identical scabbard, except for the difference in the inletted area for the blade is a chopper termed a pinahig by the Ifugao. The pinahig has a blade which becomes wider and thinner towards a relatively rounded tip obviously adapted entirely for the cut. A wooden handle surrounds a tang which may extend the full length of the handle and be folded back upon itself to secure the handle. As may be seen from example 7 below, however, the hollow metal handle construction may also be associated with this blade form. Example 6. Another pinahig, having a single edged blade showing a lesser degree of widening. 20th century. Overall length, blade and handle: 56.6 cm. (22.3 inches); blade length: 40.6 cm. (16 inches). Example 7. An atypical example with a single edged blade of pinahig profile but with the hollow integral metal handle wrapped with rattan as is seen with the hinalung examples above. The scabbard is closed with the two halves held together by two rattan bands and a few nails. The carved side (shown) is about three times the thickness of a plain back and it is this thicker side that has been inletted for the blade. Early 20th century. Overall length, blade and handle: 50.5 cm. (19.7 inches); blade length: 35.5 cm. (14 inches). Krieger, Herbert W, The Collection of Primitive Weapons and Armor of the Philippine Islands in the United States National Museum (Bulletin 137) (Washington, D.C.: Smithsonian Institution, 1926). These particular forms are not illustrated or specifically described in this work, however, other Igorot weapons and armour are described and placed in context. Plate 6, number 10 is of a spear very much like example 2 above and is described merely as "northern Luzon" in the explanation on page 116. Stone, George Cameron, A Glossary of the Construction, Decoration and Use of Arms and Armor in All Countries and in All Times (New York: Jack Brussel, 1961). A reprint of a work initially published in 1934. Igorot spears are considered under the heading of fal-feg on page 225 and illustrated in figure 278 on the same page while Igorot head axes are described on page 289 and illustrated in figure 364 on page 288. The terms pinahig, hinalung and hikot were noted in an exhibition on the Ifugao people at the Museum of Man in London in February, 1997.